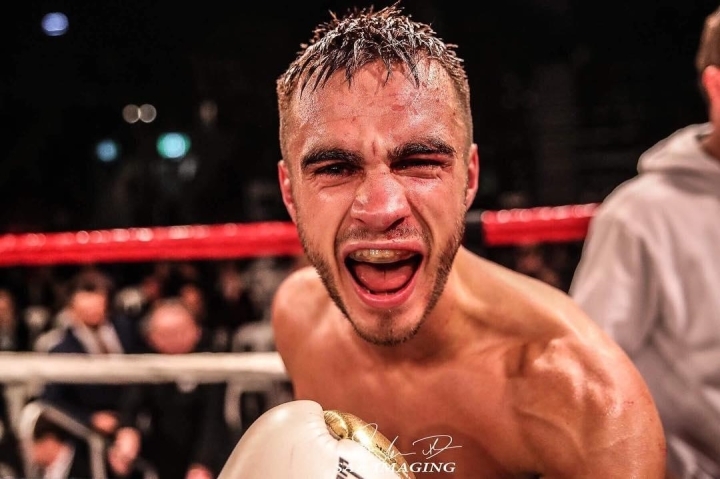 Last October, Jason Moloney came upjust short on the scorecards versus bantamweight titlist Emmanuel Rodriguez in his first career fight outside of Australia. His twin brother knew better than to leave his own road trip in the hands of the judges. Andrew Moloney punched his way into title contention, halting Miguel Gonzalez in the 8th round of their 115-pound title eliminator Friday evening in San Francisco de Mostazal, Chile. A double left hook floored Gonzalez, leaving the local favorite staggering around the ring upon rising in forcing the stoppage at 2:50 of round eight. The bout marked Moloney’s first career fight away from his native Australia, coming just five months after watching his twin brother fall just short on the road. The unbeaten super flyweight knew what to expect marching into hostile territory in Gonzalez’s native Chile, forcing an aggressive pace from the outset with no intention of hearing the scorecards. Gonzalez entered the fight having won 12 straight, but none of the opposition within sniffing distance of his lone career defeat at the hands of former titlist Paul Butler more than five years ago, Still, his handlers were big enough believers to secure the rights to the title eliminator and force Moloney to travel abroad. A taste of home cooking was served up during a questionable sequence midway through the round five. Moloney overcommitted on a combination, stumbling to the canvas only for Gonzalez to be credited with a knockdown after referee Romina Arroyo initially appeared to rule it a slip. Moloney simply shook his head in disbelief, forced to take the mandatory eight count before being cleared to continue. He took out his frustration on Gonzalez, who put in good work to the body throughout, but more so in efforts to keep pace than in initiating the action. The difference in punching power was never more evident than in the fight-ending sequence. Moloney connected with a pair of left hooks, the first one freezing in Gonzalez and the follow-through putting him flat on his back. Gonzalez (29-2, 6KOs) did his best to beat the count, but his faculties clearly not with him as he staggered around the ring. Arroyo was left with no choice but to stop the contest. Moloney steamrolls to 19-0 (12KOs), picking up his second straight notable win. The undefeated top contender battered former flyweight titlist Luis ‘Nica’ Concepcion in a 10th round stoppage win last September in Australia in advancing within one fight of his first career title fight. That opportunity will now come later this year. Next up for the 28-year old will be the winner of the June 1 showdown between unbeaten Khalid Yafai and mandatory challenger Norbelto Jimenez. No matter whom against or wherever it takes place, Moloney is once again prepared to literally take matters into his own hands. Friday’s bout aired live on TVN Chilé, streaming live and legal on the network’s YouTube channel for external viewers. This is how you do it. No sitting at home waiting for opportunity to come knocking. Go get the money. Round 6 proved exactly why there's no place for Woman officials in male boxing. "No way was that a knock down"!